After releasing the results of its Customer Service Index or CSI study last July, JD Power is now releasing the results of the Sales Satisfaction Index (SSI) study. 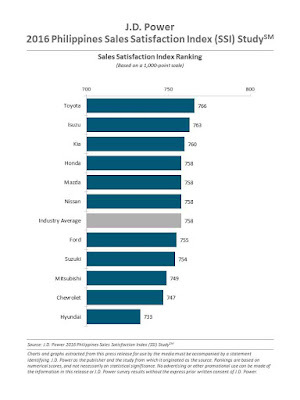 And among the 11 mass market brands in the industry, Toyota ranks the highest in new-vehicle sales satisfaction. This marks the third year that Toyota has topped the survey. Meanwhile, Isuzu ranks second and Kia third (the full results are available below). 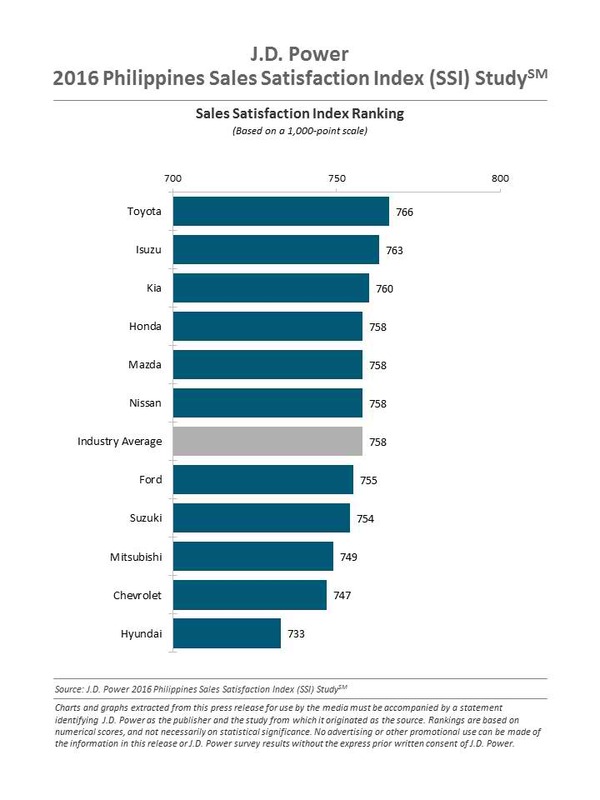 The 2016 Philippines Sales Satisfaction Index (SSI) Study is based on responses from 1,679 new-vehicle owners who purchased their vehicles from August 2015 through April 2016. The study was fielded from February through June 2016. The study finds that the proportion of women buying new vehicles has steadily increased in recent years to 45 percent in 2016 from 31 percent in 2013. While overall satisfaction among men and women is nearly the same, trends for women are on the decline (758 on a 1,000-point scale in 2016, down 7 points from 2015) while those for men are going the other direction (757 in 2016, up from 752). This should be a concern for automakers and dealerships, as more and more women are purchasing new vehicles. The study also finds significant differences in the shopping behavior between women and men. Women rely more on recommendations from friends, relatives, and other owners of the same make, while men tend to spend more time on the Internet researching performance features and technical specifications. Additionally, only 7 percent of women visit a dealership alone—the others are accompanied by a friend or family member—compared with 21 percent of men. However, what is similar between the two genders is that the majority of both women (91 percent) and men (88 percent) say they knew the exact car model or make they wanted to purchase prior to visiting the dealership. Further, the study finds that female salespeople are more effective in engaging with female customers, as they exhibit more empathy and concern for their needs. Satisfaction is higher among women who are served by female staff than among women served by male staff (777 vs. 754, respectively). Now in its 16th year, the study examines six factors that contribute to overall customer satisfaction with the new-vehicle purchase experience. In order of importance, they are sales initiation (20 percent); delivery process (18 percent); delivery timing (18 percent); salesperson (17 percent); dealer facility (15 percent); and deal (12 percent). Overall satisfaction with the sales and delivery process is 758 in 2016. Satisfaction improves in sales initiation and delivery process—essentially due to significant improvements made by dealers in reducing the greeting and vehicle handover times—but decreases in each of the other factors. Dealer Website Usage Increases Dramatically: More than half (58 percent) of all new-vehicle buyers used the Internet to shop for their vehicle. Among them, 69 percent visited their dealer’s website, a 32 percentage point increase from 2015. In contrast, fewer customers have visited vehicle manufacturers’ official websites year over year (42 percent vs. 48 percent, respectively). The information most often sought by buyers is vehicle price (69 percent); vehicle features and accessories (43 percent); and dealer information (34 percent). Test Drives at Purchase Dealer Increase Significantly: The proportion of customers who took a test drive at their purchase dealer has increased to 64 percent in 2016 from 42 percent in 2015. However, the test drive is failing to impress customers, as only 7 percent of customers are delighted (providing a rating of 10 on a 10-point scale) with their experience in 2016, down from 19 percent in 2015. Customers Are Getting Better Deals, but Paperwork Problems Lower Satisfaction: More shoppers are negotiating their vehicle price, up to 92 percent in 2016 from 77 percent last year. Furthermore, 81 percent of them were successful in getting a cash discount. Additionally, the proportion of customers taking a car loan has increased to 84 percent from 76 percent year over year, further compounding the amount of paperwork involved and leading to lower satisfaction with the timeliness of completing the final paperwork process. Satisfied Customers Are More Loyal and Provide More Recommendations: Among highly satisfied customers (overall satisfaction scores of 834 and higher), 44 percent say they “definitely would” purchase the same brand of vehicle and 51 percent say they “definitely would” recommend the brand to family and friends. In contrast, among customers who are highly dissatisfied (scores of 708 and lower), only 21 percent say they “definitely would” repurchase the same brand and only 34 percent say they “definitely would” recommend the brand to others.